Kansas City, Missouri -- Worlds of Fun is excited to announce the addition of Cotton Blossom Bar B Que, a brand-new dining concept coming in 2019. The restaurant will feature a bevy of new and improved food options that are sure to make the dining experience just as memorable as the rides. The culinary team, led by our new executive chef Wesley Boston, is crafting a new menu that will include authentic Kansas City BBQ with homemade sauce, rotisserie chicken, home-style sides, desserts and more. Healthier options are also expected to be added. The 9,036 square-foot restaurant will be conveniently located in the Americana section of the park and will feature porch style seating for up to 184 guests. Next door to Cotton Blossom Bar B Que and replacing Pizza Pier, an outdoor seating patio will be built to accommodate up to 132 guests. It will be the largest dining location at Worlds of Fun. 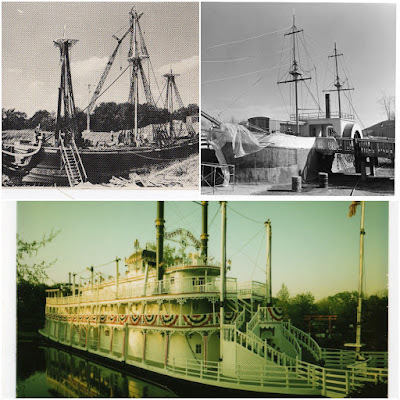 The theming, architecture and name of Cotton Blossom Bar B Que pay tribute to the early days of Worlds of Fun and the three historic boats that opened with the park in 1973 – Henrietta, Cotton Blossom and Victrix. The three boats were previously historic movie props that were purchased at MGM Studios in Hollywood. Henrietta, from the movie Around the World in 80 Days in which the park is themed after (or the novel at least), served as the former park entrance. Boathouse Grill will be located very closely to Henrietta’s former location. Construction on the new restaurant is expected to start during the offseason. When it opens its doors in the spring of 2019, Cotton Blossom Bar B Que will be Worlds of Fun’s flagship dining location and will be included in the park’s dining plans.